If you’ve ever watched a good tear-jerker of a film and felt strangely happier afterwards, you’ll know the power of a good cry. Now it seems Japan is actively encouraging its schoolchildren and workforce to reap the mental health benefits that come with shedding a few tears. Former high school teacher and self-styled ‘namida sensei’ (tears teacher) Hidefumi Yoshida has been giving lectures about the importance of crying to companies and schools for almost six years. In 2014, Yoshida teamed up with Hideho Arita, professor emeritus at the Faculty of Medicine at Toho University, and others, to raise awareness of how crying can reduce stress. When Japan brought in mandatory workplace stress checks in 2015 for companies with more than 50 employees, they were inundated with invites to speak with employees about the power of crying. 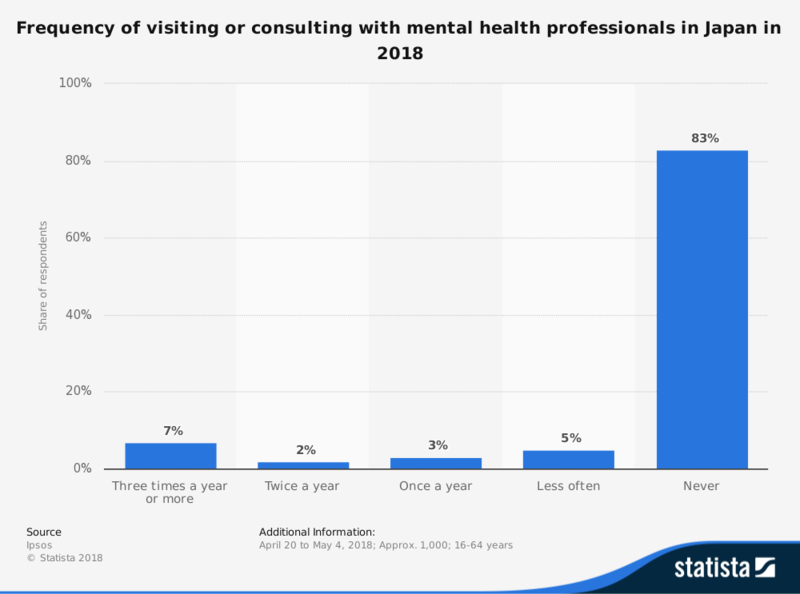 Japan, like many other countries, has only recently started to deal openly with the mental health issues some individuals experience. Until the late 1990s, depression wasn’t a term used widely outside the psychiatric profession. But the stigma persists. In a 2016 London School of Economics study of eight countries, employees in Japan were the least likely to tell employers about depression, followed by Americans. Overwork is a such a big problem that the Japanese invented a word -- karoshi -- for deaths caused by overworking. 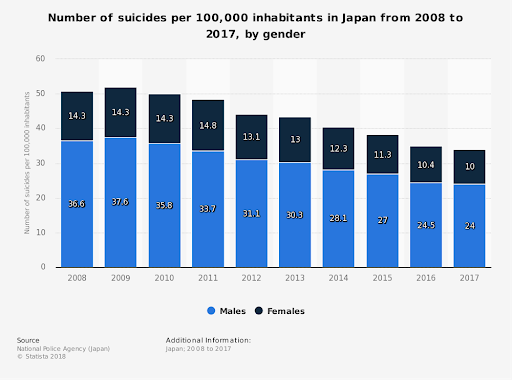 Although Japan is known to have one of the highest suicide rates in the developed world, numbers have dropped by more than one-third (38%) since its peak in 2003, to 21,321 cases in 2017. At 16.6 for every 100,000, it’s still too high though - among the G20 countries, Japan has the third-highest rate of suicide, behind South Korea (25.8) and Russia (19.3). More than 90% of those who attempt suicide suffer from depression. According to figures from the World Health Organisation (WHO) released on World Mental Health Day in October, half of all mental illness begins by the age of 14, but most cases are not spotted or treated. Suicide is the second most common cause of death among young people aged 15 to 29. In its Mental Health Action Plan 2013-2020, the WHO reported that depression is among the largest single causes of disability worldwide and accounts for 4.3% of the global burden of disease. The economic impact is huge. The LSE study estimates depression collectively costs Brazil, Canada, China, Japan, Korea, Mexico, South Africa and the USA more than $246 billion a year. For Japan alone, this figure is $14 billion in lost productivity due to employees calling in sick or being unproductive when they do show up for work. The global gap between the need for treatment and provision is still wide. 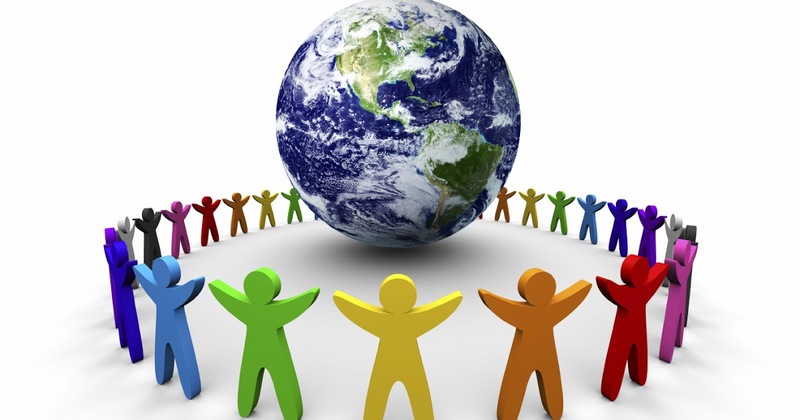 Annual spending on mental health is less than $2 per person, and less than $0.25 in low income countries. In high-income countries, between 35-50% of people received no treatment for severe mental health disorders, which rises to between 76-85% of people in low and middle-income countries.